Technology Evaluation Centers' (TEC's) recent three-part blog series focused on the general sessions of Sage North America's Analyst Day in Boston in February 2011. At that winter event, Sage, nine years since its last analyst summit, took a gigantic step forward in clarifying its position in the market. 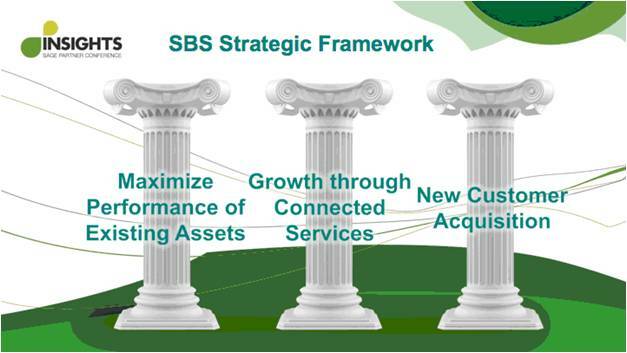 Prior to the analyst day, during its Insights 2010 user conference, Sage had come up with its own extraordinary customer experience (ECE) three-pronged strategy dubbed "Enrich, Connect, Grow" (see Figure 1). Enrich refers to maximizing performance of existing information technology (IT) assets (Sage products), while Connect is about incremental growth via the connected (cloud-based software) services. Finally, Grow is all about new customer acquisition, by various means. This article covers the afternoon of Sage's Analyst Day 2011, which consisted of several concurrent sessions that focused on various horizontal product lines and vertical solutions. Each breakout session was presented through the prism of aligning the product line with the overall corporate "Enrich, Connect, Grow" strategic framework. The first breakout session that I elected to attend was the presentation by Laurie Schultz, Senior Vice President and General Manager for Sage Business Solutions' mid-market enterprise resource planning (ERP) solutions. Sage North America's ERP division has a significant ecosystem of more than 75,000 customers paying 8 million of their employees every 2 weeks and processing 300,000 credit card transactions. In the North America region, the vendor also has over 2,000 value-added resellers (VARs) and 500 independent software vendor (ISV) partners. While having a hefty number of ERP solutions in its portfolio has traditionally presented an integration and positioning puzzle for Sage, it has also given the vendor the ability to cover more ground, being able to offer solutions for the lower mid-market all the way through upper mid-market enterprises, for both local and global operations (according to customer preference). Today, there are many migration paths between these products (with investment protection pricing arrangements by Sage), and these ERP solutions also tend to cover diverse verticals. Sage North America has recently simplified its ERP portfolio positioning into three tiers (see Figure 2). The Sage ERP MAS product line serves the lower end of the mid-market for companies with local operations in the light manufacturing and assembly and healthcare segments. These products are the most mature and the least technologically advanced of all Sage ERP products, but come with the lowest total cost of ownership (TCO). Converted into subscription equivalent pricing, Sage ERP MAS 90 software can cost as little as US$67/user/month (for 10 users over 7 years, in this example). Sage ERP MAS 90 and Sage ERP MAS 200 will be enhanced in 2011 and 2012 via SageCRM, Sage Intelligence, and Sage Advisor capabilities as well as via the connected services (which were explained in great detail in the aforementioned blog series). At the same time, somewhat behind the market trends, these products will be Web-enabled and, since November 2010 they support Microsoft SQL Server (in addition to their proprietary and esoteric ProvideX database). Sage ERP Accpac and its hosted counterpart, Sage ERP Accpac Online, cover lower to core mid-market companies with multi-country operations (especially in English-speaking countries) and local processes in the light manufacturing, service, mining, and hospitality sectors. Sage ERP Accpac has about 45,000 customers, 250 ISV partners, and 1,000 resellers worldwide. Compared with its MAS siblings, Sage ERP Accpac is technologically superior, is international (with a solid market share in Canada, South Africa, India, etc. ), and offers more choices to customers. Its major modules are finance and operations, along with Sage customer relationship management (CRM) and business intelligence (BI) capabilities. Accpac has long had three-tiered product architecture with separate user interface (UI), business logic, and database layers. The product supports the Pervasive, Microsoft SQL Server, and Oracle databases, and Microsoft Windows and Linux (both the Redhat and SuSE versions) as server operating systems (OSs). As previously mentioned, Sage ERP Accpac offers the best of both worlds when it comes to deployment. Companies can select either on-premise or on-demand software deployment (with traditional perpetual license or subscription pricing) options and, if necessary, move between these relatively easily, since both product instances are delivered from one source code. Hence, Sage's partners can also offer a choice to their customers without users having to learn a new product. In February 2011, Sage released Sage ERP Accpac Version 6.0 with a few major objectives, starting with the goal to increase the product's overall competitiveness. That goal is to be achieved via a new "pure Web" framework, browser-agnosticism (i.e., users can use either the classic UI or the new mobile-enabled Web UI), mobility support, embedded BI tools, simplified user/role personalization, and a blurred (integrated) CRM and ERP experience. Another objective was to provide a compelling value proposition for the installed base by helping to alleviate users' major pain points. To that end, SData (Sage Data) integration technology and Google WebToolkit have been used for reporting and usability, and for the purposes of lower TCO. A smooth upgrade transition was made possible by introducing a new, optional Web-based UI layer that customers can adopt whenever they are ready. The Sage ERP Accpac Version 6.1 release is expected to make all core modules Web deployable (and browser agnostic). Sage ERP X3 (formerly Adonix X3) has meanwhile become Sage's true global offering for the core mid-market to upper mid-market. The product is targeting companies in the following verticals: hard goods manufacturing, chemicals, food and beverage (F&B), life sciences, and wholesale distribution. Within the Sage Group, Sage ERP X3 has a collaborative governance board, global marketing and communications, global product management and research and development (R&D), and a global Sage ERP X3 practice. With its open and scalable infrastructure, Sage ERP X3 is suitable for upper mid-market companies with up to 1,500 concurrent users. The product features a multi-tier, Web-oriented architecture (WOA), and supports multiple database, OS, and deployment models. With its Sage Application Framework for the Enterprise (SAFE) X3 platform, upon which partners can build their solutions, Sage ERP X3 resembles Microsoft Dynamics AX with its global platform play (Microsoft’s chosen ERP platform offering, previously detailed). Sage ERP X3 V6 was released in 2010 with enhanced multi-legislation Representational State Transfer (REST) architecture, with availability in more than 50 countries. The product currently has 3,000 customers, and its ecosystem consists of 1,500 consultants and 200 partners. To express Sage North America ERP through the prism of Sage's "Enrich, Connect, and Grow" strategic framework, Enrich is about maximizing performance of existing assets. To that end, Sage has made major efforts to shore up its existing install base. Using an internally adopted Net Promoter Score (NPS) (briefly described in our blog series) on a scale of 1 to 10, Sage has reportedly grown so-called evangelists (customers answering 9 or 10) by 5 percent, while at the same time reducing so-called detractors (customers who respond 1 to 6, who are unlikely to recommend Sage's products or partners to their peers) by 7 percent. The vendor hopes to gain economies of scale by leveraging common modules and technologies, such as SData and Google WebToolkit. This approach should help in terms of quality, usability, TCO, reporting, functionality, etc., as well as promoting favorable NPS metrics. Connect refers to growing revenue per customer or share of wallet (SoW) through various connected services. The idea is to add value for customers by bridging their on-premise ERP systems to cloud-based solutions, for merchant payments, employee payments, and sales and marketing purposes (as explained elsewhere). Grow is about acquiring new customers by exploiting unique differentiating traits in terms of vertical solutions, sales channel areas of expertise and geographic reach, and the relative complexity of customer businesses. Another afternoon session that I attended was the update on Sage's CRM solutions by Joe Bergera, then Executive Vice President and General Manager of Contact Management Solutions, and Larry Ritter, Senior Vice President and General Manager Global Product Management and Marketing, Sage CRM Solutions. Contrary to its ERP counterpart, Sage's CRM portfolio is straightforward to position and has always had a global nature. The portfolio is constituted from only two acquisitions (former Interact Commerce SalesLogix and Accpac), compared with the umpteen ERP and accounting acquisitions Sage has made in North America alone. Sage's family of three CRM solutions supports over 75,000 businesses and 3.6 million users with a wide range of business requirements. Sage ACT!, a popular contact management product, is used by small business owners and sales, marketing, and other professionals, often sold on an individual (1:1 and 1:many) basis. The product serves 56,000 small businesses and 2.8 million individual users. 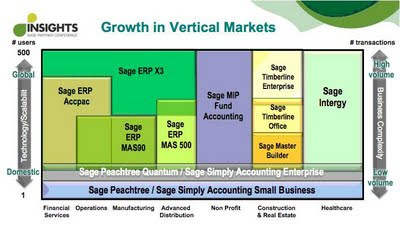 For their part, SageCRM and Sage SalesLogix together serve nearly 20,000 corporations and 850,000 users. While SageCRM targets the users in finance and back-office operations, Sage SalesLogix is primarily a sales and marketing and front-office operations tool. Sage is cognizant of the key trends in CRM, primarily the consumerization of business. This translates into modern CRM systems that incorporate social media, promoting user interaction that is personalized and intent-driven. Other trends are the need for predictive, ad-hoc, and real-time analytics as well as for business process optimization via turnkey configurable systems and role-based workflows. Possibly the most prominent CRM trend is mobility—particularly device-independent mobility—with a rich user experience and allowing task-oriented user actions. Smartphones with Web browsers have become standard, since their ease of use and ready access encourage mobile CRM adoption, and there is increasing support for employees to use their own devices (as opposed to employer-supplied devices). Moreover, real-time updates reduce latency. Last but not least, the CRM software category has seen mainstream and ubiquitous adoption of cloud computing for its rapid deployment, flexibility of IT infrastructure, and buying and ownership options. Thus, Sage's CRM strategic focus is to provide CRM solutions that are proactive, collaborative, adaptable, mobile, and services-enabled. Adaptability and services-enablement come from SData-enabled integration between Sage’s ERP and CRM products and to third-party solutions (services). The aforementioned SData Framework is at the core of adaptive ERP and CRM integration with real-time data availability, whereby dynamic transactional data (e.g., prices, accounts, contacts, orders, etc.) are managed by ERP business logic using two-way synchronization. Static master data, such as products, units of measure (UOM), etc. are handled with one-way synchronization. Relevant user experience and data consistency and control are preserved. ERP and CRM integration includes processes (cross-application workflow) and visibility (insight) across applications. For the latter, CRM users can hereby visualize back-office information in order to manage customer credit information, evaluate the invoice pipeline, etc. Sage CRM systems’ proactive nature advances out of personalized and contextual user experience, with alerts for high-priority tasks and events. Task-relevant views drive user productivity and adoption. The aggregation and "publish and share" capabilities as well as advanced analytics with actionable insight also help in this regard. Collaboration is achieved through expanded enterprise search capabilities. Search is a common CRM task, and the current speed, simplicity, and depth of search in Sage's CRM products matches a typical Web experience. Social media plug-ins, which are available today for Sage ACT!, Sage SalesLogix, and SageCRM, are another collaborative feature. They help users find and import information from social networks to create immediate awareness; the necessary actions are then assigned and tracked. Mobile CRM has been enabled via the SData integration framework and with support for HTML5 to deliver ease of use and browser and device independence. Sage’s CRM products currently support several browsers—Safari, Firefox, and Chrome—and mobile devices—Apple iPhone and iPad, Google Android, and Blackberry OS6. Indeed, Sage's significant new competitive differentiators in the CRM market are SData-based integration for unified ERP and CRM and its mobile CRM capabilities, including ease of administration, device coverage, and price. With its large market footprint, Sage CRM is positioning itself to play a leadership role in future waves of cloud computing adoption. Sage SalesLogix is another Sage product line, in addition to Sage ERP Accpac, that already offers multiple deployment options and has the same code available in on-premise and single-tenant cloud software editions. 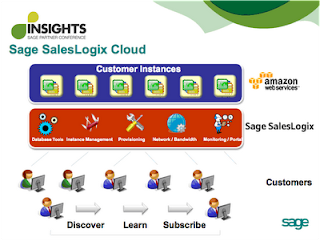 The Sage SalesLogix Cloud CRM deployment offering is built upon the Amazon Elastic Compute Cloud (EC2) infrastructure. The offering has been available to new North American customers since June 2010 for US$65 per named user per month. Current Sage SalesLogix on-premise customers who wish to migrate to the cloud can do so for US$35 per named user per month. Multi-user and multi-year discounts are also available. Sage has been expanding its CRM cloud solution to other regions. Sage SalesLogix Cloud provides buying and ownership experience choices. Companies that prefer to buy on-premise perpetual licenses do so for the lower TCO, existing IT infrastructure, regulation and compliance, and on-site control. On the other hand, some enterprises prefer to buy on-demand subscriptions for the instant on, the outsourced IT resources, payment flexibility, and reasons of operating expense (rather than capital expenditure). 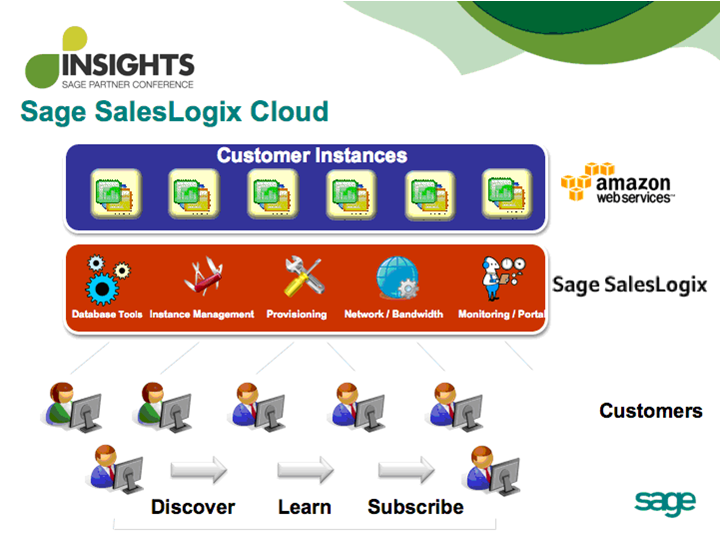 As depicted on Figure 3, Sage SalesLogix Cloud is a subscription-based, hosted solution on Amazon Web Services (AWS) in a private instance for each tenant (customer). The cloud edition has a full SalesLogix feature set and is built on open standards. The private tenant setup in the database layer allows for upgrades to be controlled by customers at their preferred pace. Sage manages the cloud operations in terms of database tools, instance management, provisioning, network bandwidth, monitoring portal, recovery, support, etc. Given multi-tenancy on the application layers, Sage SalesLogix partners can get a piece of action by taking care of applications configuration, integration, customization, and administration. As a nice-to-have feature, 100 GB of storage is included, free, for every 50 users on an account (which other cloud CRM providers charge for). Additional storage is available to purchase (100 GB for US$50 per month). Users have an ample choice of subscription packages, starting with the functional scope of the user (e.g., core CRM, analytics, and remote use). There is additional pricing for some capacity-based capabilities, such as a customer portal, alerts, and e-marketing, and for some system services provided by Sage, such as a data staging environment and managed server. The vision for Sage's CRM Solutions is closely aligned with that of Sage North America and provides significant new opportunities. In terms of Sage's "Enrich, Connect, and Grow" strategic framework, for Sage North America CRM Enrich is about maximizing the performance of existing assets. To that end, Sage pledges to ensure best-in-class user and administrator usability, the highest possible rate of end-user adoption, and the lowest TCO. Similarly as for Sage North America ERP, Connect refers to growing revenue per customer (or SoW) through various connected services and new features-as-a-service, where the features are adjacent and can be discovered and selected for download by users. Grow is about acquiring new customers via mobile CRM modules; fully integrated analytics with pre-built, role-based content; and integration via adaptive workflow with ERP and Sage Online business solutions. This is not your older brother’s Sage. While in many ways Sage has stayed true to its values and principles, the vendor has judiciously embraced cloud computing and constructed a plausible future direction for its partners and customers that was hard to imagine before. Many mid-market companies in industries that Sage targets should inform themselves about the vendor’s most recent CRM and ERP enhancements, as they might be pleasantly surprised with the wealth of enhancements and capabilities. P.J. Jakovljevic - May 13, 2011, from Technology Evaluation Centers' (TEC's).